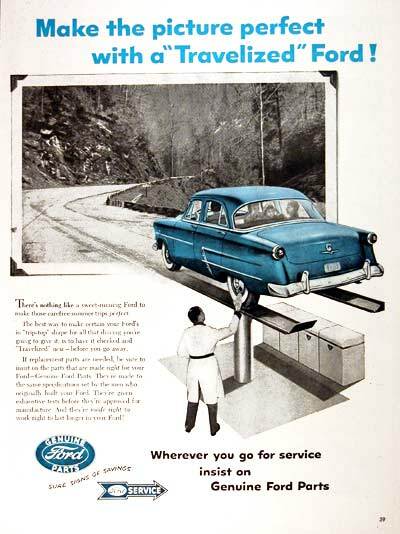 The least expensive Ford in 1954 was the Mainline Tudor Sedan. It listed for $2,132 f.o.b Windsor, Ontario and tipped the scales at 3,140 pounds. The Ford Motor Company of Canada Limited celebrated its Golden Jubilee in 1954. It had been fifty years since Henry Ford and Gordon McGregor signed the papers that transformed McGregor’s faltering wagon works in Walkerville (Windsor), Ontario into an automobile manufacturer. The deal included the rights to sell Ford products in virtually every colony and possession of the far-flung and vast British Empire. All the stops were pulled out for an unforgettable birthday bash that was celebrated from coast to coast. Management threw a party for the nation’s 1,003 Ford-Monarch and Lincoln-Mercury-Monarch dealers in Toronto from January 6 through 8 of 1954. It was an event that made national news. Dubbed the Jubilee Conference, the event included a complete display all of the new cars, trucks and tractors, domestic and imported, sold throughout the Dominion. Ford, Meteor, Mercury, Monarch, Lincoln, British Fords, Thames trucks and Ford tractors were the corporate jewels that sparkled and shone for all the world to see. On August 17, the festivities continued as the famed Musical Ride, executed by a team of 32 red-coated Mounties, was put on for the public. The RCMP entertained an enormous crowd with its spectacular show of intricate horseback military manoeuvres. The 1954 Ford Customline Fordor Sedan was a favourite with consumers. At $2,312 it cost $104 more than the Mainline Fordor Sedan. Ford milestones were many. The company was Canada’s oldest automobile manufacturer. Officials could proudly boast that workers had built 1,437,961 Ford passenger cars from 1904 through to the end of 1953. Meteors, Monarchs, Mercurys and Lincolns pushed the figure higher. Still Canada’s leading automobile and truck manufacturer, Ford maintained that position because of its enormous export market. On the home front, however, GM Canada garnered slightly more than 50 percent of domestic sales. Ford could still claim that 40 percent of all cars on the nation’s roads were Ford. The 1954 Fords were introduced to the public on January 14th. They were especially late this year because reconversion to civilian production had been extremely difficult for all the automakers at the end of the conflict in Korea. The cars were popular with consumers, a Saturday shift was added at the factory on Valentine’s Day to keep up with demand. On March 15, the last Ford rolled out of the factory doors in Windsor. Production was now centred in the new 32.5-acre factory in Oakville, Ontario, the largest and most modern automobile factory in the country. While hard on the comeback trail there was not enough money for a new envelope. The basic automobile shell for the 1954 Golden Jubilee Ford was the same one used in 1952 and 1953. The grille continued to be a floating bar with a fuselage-like protuberance at the centre. This year, the bar was opened up to sport a hollow theme and parking lamps were incorporated into the extreme ends before it wrapped around the corners of the fenders. The 1954 Ford Country Sedan could seat six passengers. Price for the wagon was $2,827. An all-new Crestline family joined the Mainline and Customline series. The prestige line was all glitz and glamour, chrome and extras. It was made up of a poshly appointed Fordor Sedan, a Skyliner, a Convertible and a Victoria. The Country Squire was not sold here. The Customline series was mid-priced, comprised of a Tudor and a Fordor Sedan, a Country Sedan and a Ranch Wagon. The Club Coupe was not available in Canada. The modestly appointed Mainline series was the most economical of them all, consisting of a Tudor and Fordor Sedan and a Ranch Wagon. The Skyliner listed for $2,750 but the price would be reduced to $2,464 in April. Under the hood lurked the tried and true Ford V-8, first appearing on the market in 1932. 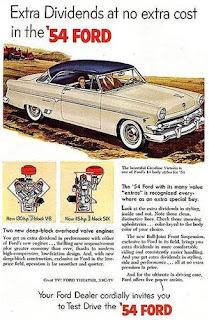 American Fords were being fitted with a new Y-block V-8 mill and also six-cylinder mills but Ford of Canada made use of the flathead engine in all its cars for one more season. The Astra-Dial Control Panel was straight out of the space age. The speedometer was placed high on the control panel “where it is in your line of sight. The safest place for a speedometer to be located because you hardly need to take your eyes off the road to read it.” The speedometer was placed in a dome-shaped shroud with a rear-facing transparent hood. “This allows daylight to illuminate the needle and dial for even easier reading.” Soft diffused lighting makes it easy to read at night.” For safety’s sake, controls were clearly marked and illuminated. Idiot lights were taken to a new level at ford. Boasting that the oil pressure light and the generator light were automatically self-checking, they eliminated the need to look at two fewer instruments! The Astra-Dial instrument panel was the latest word in style, beauty and convenience. Just a few of the options available included seat coverings, a rear window defroster, a rear seat radio speaker, a spotlight with or without mirror, a portable spotlight, backup lamps, lights for the glove box, engine compartment and the luggage compartment. One could have outside rear view mirrors, a non-glare rear view mirror, a vanity mirror. 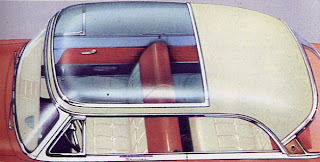 One could order turn signal indicators, the See-Clear windshield washer, a grille guard, a rear deck guard, a bumper wing guards, a windshield visor, window vent shades, floor mats, a locking gas tank cap, tire chains, an electric or hand-wind clock, a hand brake signal, an automatic cigar lighter a Coronado deck conversion (continental spare tire kit), wheel covers, whitewall tires, wheel discs and trim rings, a deluxe steering wheel, rocker panel trim, rear ender shields (Fordspeak for fender skirts), rear fender ornaments, a deluxe hood ornament and exhaust deflectors. Dealers would be happy to talk to you about the MagicAire heat and defrost system, the Master-Guide Power Steering, and the Super Range seven-tube radio, or the Console Range radio with five tubes and many other goodies that one one’s Ford fun to drive. Ford workers had been without a contract for nearly a year and negotiations weren’t going particularly well. By gentleman’s agreement, management and labour agreed to do nothing to provoke each other during the Golden Jubilee year. Both sides kept their word as they negotiated toward a new working agreement. Management announced that the model year would end on October 31. Workers, unhappy that labour negotiations were stalled out, and displeased that their latest demand for a 30-cent an hour increase had been rejected, shut down the Oakville factory on the 10th. The walkout spread and brought an early end to the selling season. The lights went out all over Ford of Canada’s operations and the buildings would sit eerily silent for 110 days. 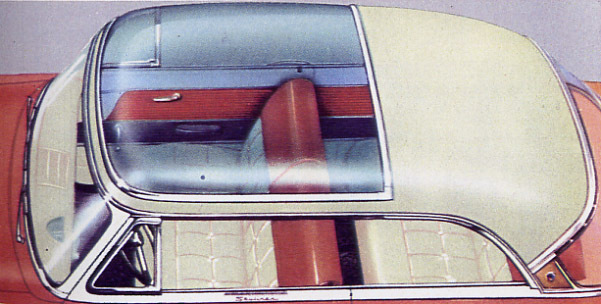 The sassy Sunliner was Ford's open car offering. It sold for the same price as the Skyliner.